Sofia has that exact same dress in pink. Coincidentally she wore it to the reception for the Canadian state visit, just a few weeks before her pregnancy with Gabriel was announced. I like Silvia best here. Victorias dress is boring. She can do much better! 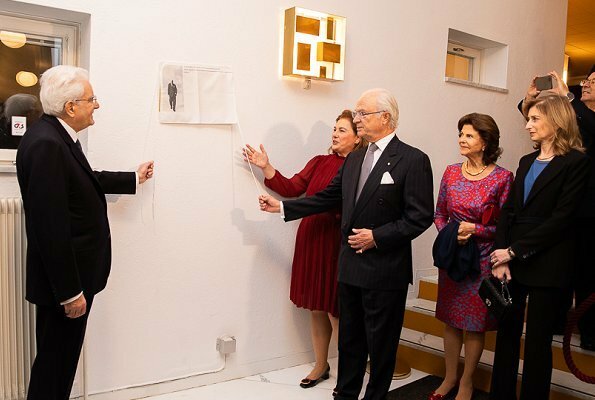 Queen Silvia looks amazing as usual. I dont know what on world is Sofia and victoria wearing. Both Victoria’s and Sofia’s dress should be shortened to knee level. Silvia’s dress is just horrid. Silvia is winner, second price goes to Sofia. Victoria´s dress is fat too busy to my taste. 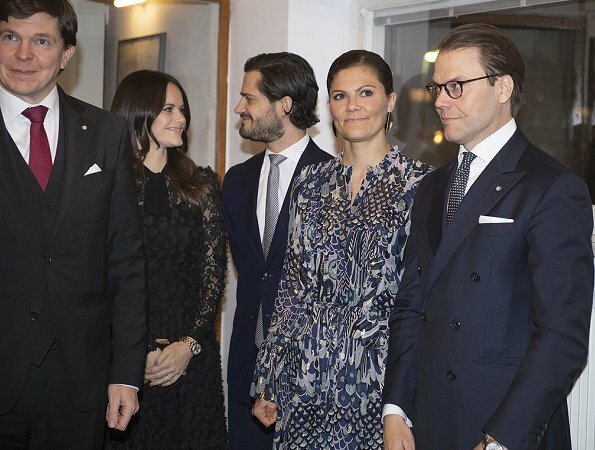 Love the shates of blue and white in the pattern on Crown-Princess Victoria´s dress and her genuine smile. 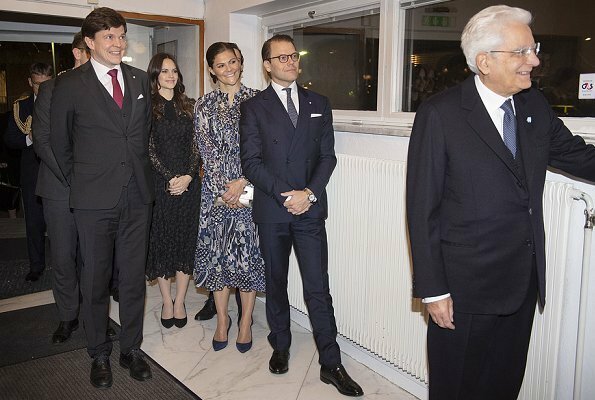 The Sjostedt-dress in black is much better than the pinc one, very flattering on Princess Sofia. Carl Philipp wears a modern suit and looks very handsome. I quite like this couple, they interact in quite and soft way. 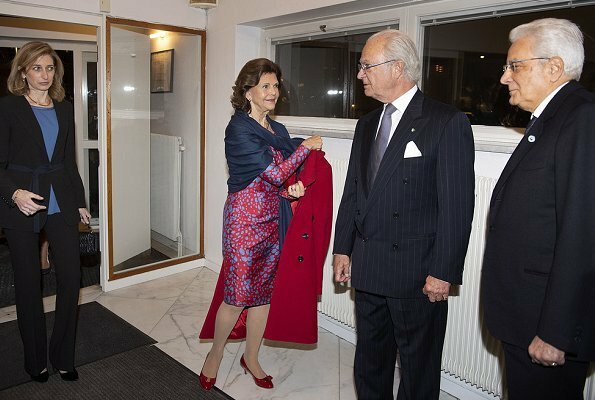 Queen Silvia is always perfectly dressed. Sophia's dress is, in my opinion, close to horrid. The Crown Princess's dress is OK.
Sofias dress is not a new one. I was wrong, Sofia has a similar dress in pink which she has worn before and another similar in black is an evening dress. In the heading is said, that it is a evening event and if you look on the windows you can see it is night outside, isn´t it? If it is cloudy it can be dark outside already before 4 pm here in the north. I do not understand your comment. Her evening dress/evening gown is long, until the floor, but that one is not. Nobody is having a long dress. Many here - including me - can't write perfect english, but we most do understand what others are meaning. I don`t know what i wanted to say..?? A big no for the dresses....urk! women who is able to wear the dress looking like a thing between a nighty and ..
the queen looks great, beautiful dress, coulours and fit; the princesses not so much (I guess Victoria could get a "pass" - but barely so; Sophia's dress is... beyond words for a day outfit; she is certainly one of the royals with the poorest taste - in my opinion; rarely can I say I like what she wears; I find that particularly disappointing, she has a nice figure, obviously money to spend - it's not like she isn't buying lots of outfits, just her choices are in such poor taste). My answer was to anon at 4:09 AM and I agree with anon at 1:00 PM. Lovely outing again for the SRF. Victoria's dress is making me dizzy, Sofia's dress to many little flowers on it not my taste.Silvia's style is nice but I don't care so much for the print. OMO.